ILLUSTRATION: NOAH KROESE: Let's Be Franc. Here's the latest comic for Investing.com. This week's subject was the rate fix of the Swiss Franc as well as the ECB's initiation of quantitative easing measures. The team at Investing.com asked me to draw another two-panel comic. 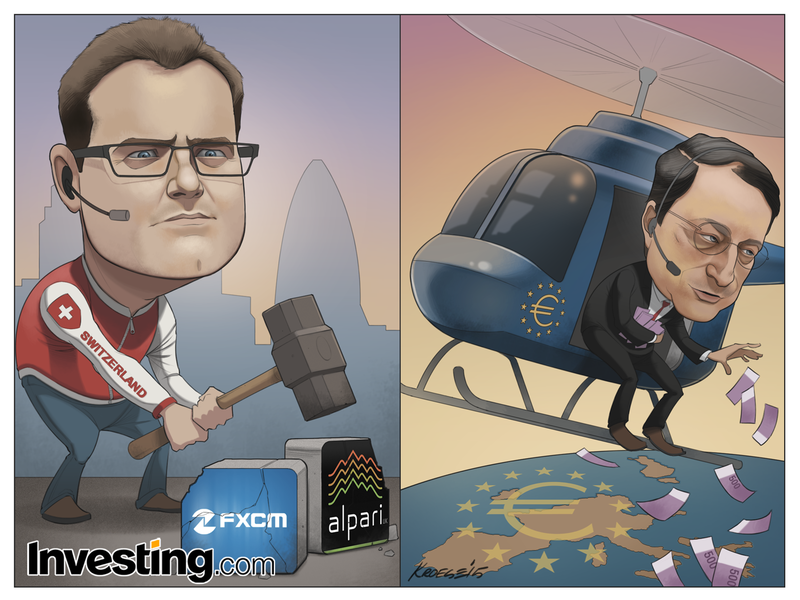 In the left panel, they asked me to draw SNB Chairman Thomas Jordan swinging a sledgehammer down onto the logos of two companies (FXCM and Alpari). Both of these companies were adversely affected by the rate cap. 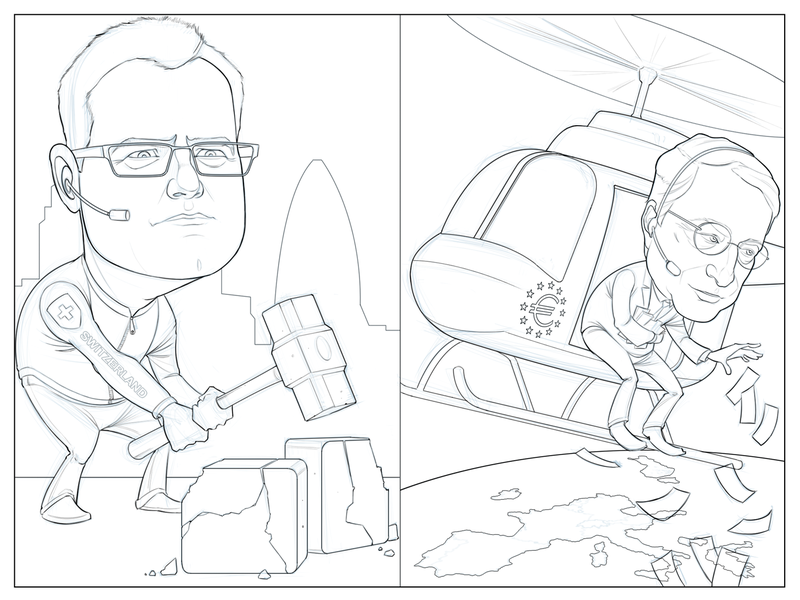 In the second panel, I was asked to draw ECB head Mario Draghi tossing Euros from a helicopter down onto Eurozone countries. The two-panel cartoons are actually pretty rough. Well, "rough" is a relative term. 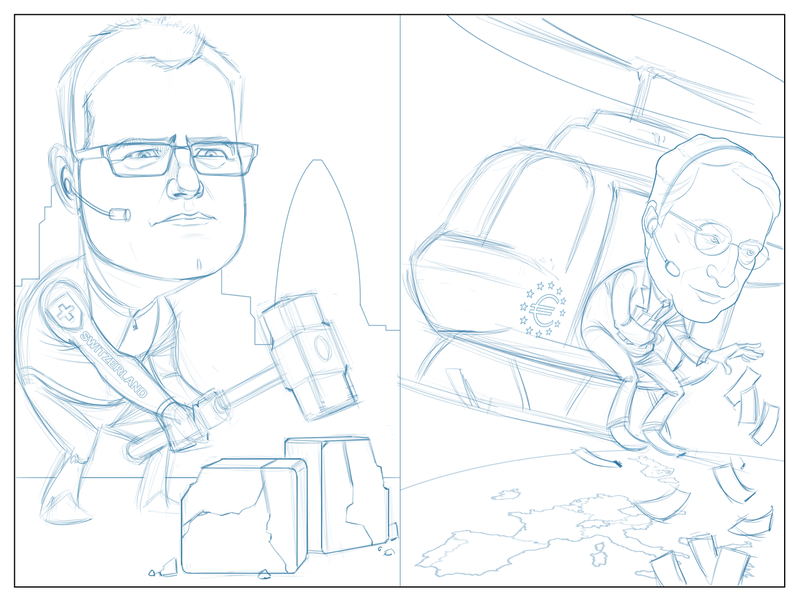 As I've mentioned before, drawing cartoons is mostly an easy job. At least, the labor part of it is easy (compared to say, hanging drywall or pouring concrete). But it's still a long, stressful day. Two panels means two backgrounds, two different sets of color and detail and shading. That having been said, it's still fun. The variety and the challenge keep things interesting. And I'm still doing my best to keep the comics visually interesting and distinguishable from each other (ie-not using the same backgrounds, sky color, poses, angles, etc.). Sometimes I think I'm able to accomplish this, sometimes, not so much. I know I've said this before, too, but sometimes I'm able to think under pressure and still focus on the craft of the illustration, color, composition, etc. And sometimes it's just a blind panic where I'm sweating and wondering how I'll ever make it to the end of the day. I THINK I'm getting better, but I'm not sure. It's hard to measure progress when it's slow and you're the one looking at it all day every day. It's like being aware of your own aging process. You look at your mug in the mirror every day, so you don't necessarily see new lines as they come in. But if you compare your face to a photo from several years ago, you're bound to see the difference. Same deal here. I think I can look at early comics and see that I've improved in my abilities. I think my sense of color is getting better. I think more about composition as well. But there are things I know I need to be cautious about. For instance, I think my drawing is actually getting cleaner. That might be a good thing if my lines were sloppy to begin with, but they weren't. And if my drawings get too clean, they start to lose personality. They need to still feel human. Otherwise, all the emotion and expression are drained out. Just a thought. Anyhoo, I'm wiped out. Another deadline met, another comic drawn. This time I think it came out well. I'm happy with the results. Until next week.